Want Free Tickets to a Cubs Game? | Have Game? Will Travel! Want Free Tickets to a Cubs Game? It appears the secondary ticketing market around Wrigley Field has finally bottomed out (at least for a few days). I received two free tickets from a fan outside of Wrigley Field to today’s Cubs game. How did I get two free tickets in one of the toughest seasons to even buy Cubs tickets at face value? The steps are simple if you are able to execute them properly. 1) Look for people employed by the Cubs with tickets in hand. Today I found a Cubs employee holding an extra ticket by the “day of game” ticket box office. Knowing that I received free tickets from a Chicago police officer to the Cubs game on July 23, 2003 and from an Oakland Raiders security guard on October 22, 2006, I knew to ask the employee for the ticket. However, I hesitated for about 10 seconds. In that time another man walked up to the employee and asked where he could buy Standing Room Only tickets. 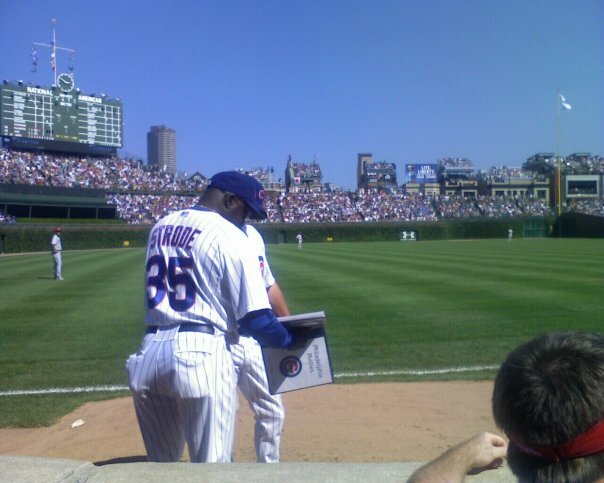 The Cubs’ employee handed the man the ticket and I was out of luck. He had no more tickets. 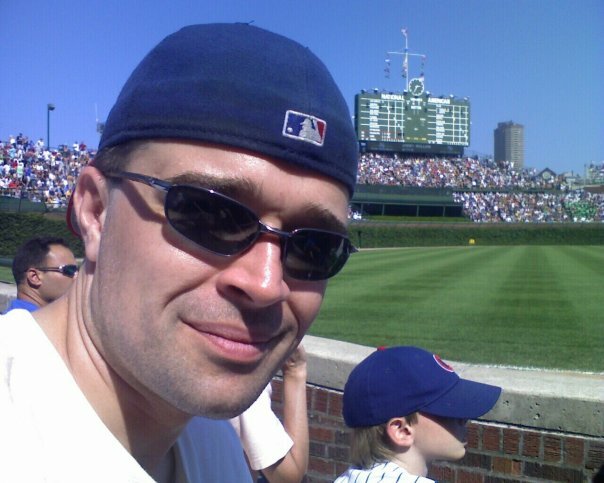 2) After being negged by the Cubs employee, I considered buying a $15 SRO ticket. However, since I was now determined to find a free ticket I walked to the corner of Addison Ave. and Clark St. Normally, the front of Wrigley Field is the best place to find free tickets since most fans meet at that location. One fan was holding up two tickets – meaning he had extra tickets and was having trouble finding anyone who would buy them. I offered the man $10 for a $66 face value ticket (he probably would have taken $20 but I was in a free ticket mood). Of course, my offer was rejected but it led to the ultimate goal. 3) Immediately after making the $10 offer, another fan told me he had two extras. I asked him what all scalpers ask, “Do you want any money for those tickets?” If a negotiation is next, the fan will always say yes. However, the mere question leaves most fans wondering if the tickets are even worth anything and their fear of “scalping” the tickets may be your benefit. In this case, the guy I met asked me if I was actually going to the game or was planning to resell them. I told him I was going to the game and I would enter the ballpark with him if he needed proof. I also mentioned my wife would use the other ticket (earlier in the day Nicole had decided to relax at home rather than attend the Cubs game). He handed me the two tickets and I followed him into the park. After entering Wrigley Field, I immediately called Nicole and told her to come to the game. She had a free ticket in the third row by the Cubs bullpen ($66 face value ticket). Of course, she could not resist and was at the game before the first inning was over. Read her account of the phone call here. The steps in receiving free tickets are multiple. One, you need to understand the ticket market for the day. Two, you need to be able to walk away from tickets that are at a good price. Three, you need to ask multiple people outside the ballpark for tickets and not feel stupid doing so. At some point, you need to decide whether a free ticket is feasible or if you’ll need to pay. Normally, you will not find free tickets at games – even games that are sparsely attended. However, with some determination you may get lucky every so often. Being right next to the bullpen was great. We watched Chad Gaudin, Jeff Samardzija and Carlos Marmol warm up. We had hoped Kerry Wood would finish the game in the 9th but he stayed seated. The Cubs beat the Phillies 3-2 after a controversial call at first base in the top of the 7th inning. Ryan Howard was called out on a close play at first base. After watching replays he appeared safe. If he had been called safe Jimmy Rollins would have scored to give the Phillies the lead 3-2. However, he was called out. In the bottom of the 7th, Alfonso Soriano hit a solo home run to give the Cubs a 3-2 lead which they held onto to win. Samardzija earned his first career win because of the home run.